TWENTY-SIXTH DAY. --BY DELIVERING THE SOULS FROM PURGATORY WE PROMOTE THE HONOR OF GOD. of God" ought to be the special aim in our works, most particularly in our acts of charity for the dead; and justly so, for, by delivering these holy souls, we lead them to Heaven, where alone God is Perfectly known, loved and glorified. If St. Theresa and the other saints have declared their readiness to suffer all the tortures imaginable for the promotion of God's glory in a single degree, what should we do and suffer for the deliverance of these souls from the flames of Purgatory, since by doing so we increase His glory by millions of degrees, and not for one moment only, but for eternity! Prayer: Increase, O Lord! Thy honor and glory, that all created beings may praise Thy mercy forever, because Thou hast shown clemency towards the souls who love Thee and ardently desire to behold Thee. Comfort them, then, O Lord! Let them behold Thy face in the land of the blessed, where they shall honor, praise, and glorify Thee, world without end. Amen. 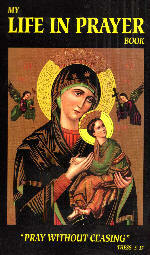 Special Intercession: Pray for the souls, who, while on earth, promoted the glory of God.